The company filed for bankruptcy. Some thought that meant they could no longer get Chuck Taylors. Do you have a pair or two of chucks for the future? Folks didn’t read the fine print. So when they heard two weeks ago that Converse Inc. was filing for bankruptcy, they jumped to conclusions. Never mind that the announcement went on to reassure them that they’d still be able to get their beloved “Chuck Taylor” sneakers. They assumed the worst. And they did. Not just to Ruby’s, but to shoe stores all around the country. Neil Rubin sold six pairs last week to a man who bought three for himself and three for his girlfriend. He also sold two pairs to Jess Lynch, 18, of Collingswood. “Omigod, I almost cried when I heard the news” about the bankruptcy, said Lynch, who was in sixth grade when she started borrowing her big sister’s “chucks,” the high-top, low-tech canvas basketball sneaker with the distinctive star. The shoes were named for Charles H. “Chuck” Taylor, an Indiana basketball star who played for company teams like the Akron Firestones and went to work for Converse in 1923, when the company was only four years old. In Converse’s heyday, the shoes were worn by the likes of Wilt Chamberlain, Larry Bird, Magic Johnson. Then came the running craze, and with it, the high-tech, super-cushioned sneakers designed to prevent foot and leg strain - a technology that quickly was transferred to basketball shoes. Converse, which stubbornly refused to go along, saw its share of the athletic-shoe market drop from 80 percent to today’s 1 percent. Count Lynch in that 1 percent. As soon as the Rutgers University freshman heard about the bankruptcy, she drove straight to Ruby’s and bought two pairs - one high-top, one low-top, both black. She figures they’ll get her through summer, although Lynch wears her sneakers year-round. 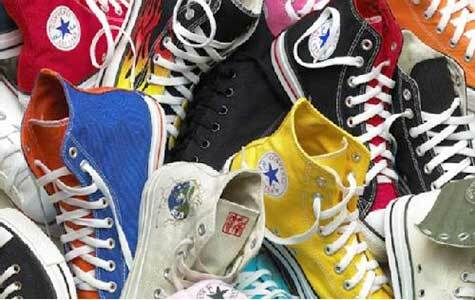 People who wear chucks fall into two categories: young and not-so. The young like Lynch wear them as a fashion statement. They go for the brightly colored styles - pink is big now, yellow was hot last summer, said Rochina Scalia, manager of City Shoes at Fourth and South Streets. “You also have your young teenage retro people, who dress like they were back in the ’70s,” she said. Then there are the baby boomers, who grew up with basic black or white chucks and never outgrew them. People said Neil Rubin, who are horrified by the thought of paying $100 for a pair of sneakers, no matter how much leather and padding they boast. Compared with that, Converse sneakers — which still sell for about $30 a pair — “are the best buy on the boardwalk,” Neil Rubin said. Besides, there’s the nostalgia factor. Neil Rubin once owned a Rolling Stones pair, with the band’s tongue logo on the side. And Steve Rubin’s voice grew soft as he recalled “the certain mystique of taking new chucks out of the box, back when they were $5.99 a pair; the absolute terror of asking my mother to spend $6 on new sneakers, when you get regular ones for $2.” He also remembered the abject humiliation of kids whose families would only spring for the short-lived knock-offs, Buck Tyler Converts. The Converse sneakers that will be made in Indonesia from now on won’t be anything like the Buck Tylers, company spokesman Mark Shuster promised. “They’ll be exactly the same, identical, the same fit, everything,” he said, the only difference being that the shoes will no longer say “Made in U.S.A.” beneath the red star on the heel.